UNLV's Robert Paulele has two catches this year for 43 yards. LAS VEGAS » Things went so badly here in 2003 that a police horse got punched and a Hawaii player's stepfather got thrown in jail -- unrelated incidents, but they both occurred at UH's last trip to UNLV, where there was almost as much action in the stands as on the field. TV: Live on pay per view, Oceanic Ch. 255. Replayed on KFVE (Ch. 5) at 9:30 p.m. Things didn't go well for the Warriors, who fell 33-22 to the host Rebels. In that game, Hawaii was like a blackjack player splitting 10s, just killing itself with its own mistakes. This time, UH comes to Sam Boyd Stadium with a No. 24 ranking and a 2-0 record thanks to a 45-44 overtime escape at Louisiana Tech last week. Quarterback Colt Brennan is off to a fine start and is getting serious consideration from serious people for the Heisman Trophy. Sam's Town was Warrior Town last night, with UH fans from all over the mainland as well as the islands checking into the team hotel. Some fans remained on the off-Strip premises last night for a Cecilio and Kapono concert. (Kapono, known as Henry Kaaihue before his music made him famous, played for UH). Other Warrior fans joined a huge party downtown, with former Rainbows basketball coach Riley Wallace -- now of the California Hotel -- serving as one of the hosts. A crowd larger than the 34,287 of 2003 is likely to attend, and it is expected to behave itself. UNLV announced a zero-tolerance policy for miscreants tonight, promising violators will be booted from the stadium and possibly taken to jail. UH coach June Jones had to administer some discipline himself yesterday. He said sophomore safety and special teams player B.J. Fruean is no longer a member of the team. Jones said he did not want to discuss the reasons, other than it is for repeatedly breaking team rules. 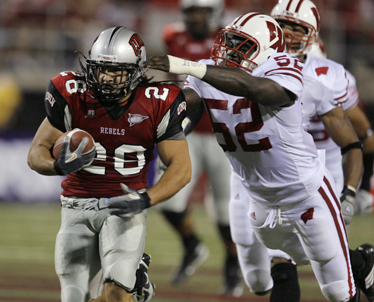 Fruean also was suspended for the 2006 season due to academics. The game should provide enough drama, with the Rebels defense trying to stop Hawaii's high-flying passing attack. But many Hawaii fans will make sure they're at the game early to see if the Warriors unveil their new haka or stay with the old one -- and if they get penalized for unsportsmanlike conduct again for doing it. "We're going to keep doing it," Jones said. "It's part of what this team is." LAS VEGAS » Colt Brennan and June Jones think a lot alike, which might explain why the quarterback is so good at running the coach's offense. But it extends to other things, too, like the value of surviving a one-point victory against a 27-point underdog. The theory is 24th-ranked Hawaii now knows it has to be ready for every opponent, regardless of the point spread. This week it's UNLV; the Warriors are favored by 17, but the Rebels come off an overachieving 20-13 loss to then-No. 5 Wisconsin. That, coupled with UH's narrow win, has Brennan expecting a tussle. "It woke us up more than anything," Brennan said. "That's how a football game goes. Do you rise above the adversity or do you let it defeat you? As Jones says, "Road games define your team and how good you are." Going back to last season, UH has four road wins in a row. The UH offensive line allowed four sacks last week in the 45-44 overtime victory over LaTech. While that may seem to be an alarming number, it should also be considered that Brennan had enough time to throw 61 passes for 43 completions, 548 yards, four TDs and one interception. Still, the line does need to improve each week, especially as the tougher second half of the schedule approaches. The area of concern should be turnovers. The Warriors had three last week, and two were avoidable. One was a botched handoff between Brennan and Leon Wright-Jackson and the other an interception when Brennan threw before checking out all his options. Another Brennan fumble was due to a wet ball. "Imagine if we fix all that?" Brennan asked. In two games, Brennan has put up a season's worth of stats for some QBs. He has 10 touchdowns to tie with Purdue's Curtis Painter for the Division I lead. He also leads in total offense with 489.5 yards per game. Ryan Grice-Mullins and Jason Rivers have been the most productive receivers, fifth and sixth in the nation and first and second in the WAC with 146.0 and 138.5 yards per game. UNLV linebacker Beau Bell is a potential NFL first-round pick, but he will need help slowing Hawaii's offensive attack. It's one thing to grind it out with Wisconsin and something else to keep up with the Warriors' frenzied air assault. "I'm expecting a shootout. They have the potential to put up points, so we'll have our plate full," Bell said. Colt Brennan has thrown only one interception in Hawaii's first two games. A traditional nemesis for UH comes into play tonight: the option. UNLV runs it, and defensive coordinator Greg McMackin says it is one of several things they do well. "We'll see a lot of trapping, a lot of option," McMackin said. "The quarterback can run and we believe he's capable of throwing the ball well, too. You always start out wanting to defend the run. We'll do that and go from there. They're balanced and very talented on offense." UNLV freshman quarterback Travis Dixon was 23-for-36 for 258 yards and a touchdown against the Badgers. When not throwing the ball, he has a thunder-and-lightning combination of running backs to work with. Frank "The Tank" Summers and David Peeples are listed as co-starters. Peeples (5-9, 205) is the quick one. At 5-10, 240, Summers, a high school teammate of UH's Davone Bess, lives up to his nickname. The JC transfer chose UNLV over big-name schools like USC that wanted him as a blocking fullback. The UH linebackers made a lot of tackles last week, and Adam Leonard came up with a huge sack that was one of the game's biggest plays. But they also failed to take the right angle on some plays, and didn't maintain gap integrity on others. This has to be corrected or Summers and Peeples will get more yards than they should. The Hawaii defensive line rotation gets a boost with the addition of end John Fonoti. Dan Kelly won WAC Player of the Week honors for his 49-yard field goal that tied Saturday's game with time running down. Kelly also hit the PAT that won it in overtime, and is perfect on extra points this year. But he also missed a field goal and had another blocked. When it comes to leg strength, Kelly is one of the best kickers in the country, but his accuracy can improve. UNLV has a very good kicker in Sergio Aguayo, who is coming off knee surgery after hurting it making a tackle last year. In 2005 he won two games with field goals and hit two 52-yarders in the same game. Ryan Mouton returned four kickoffs for 93 yards for UH last week, but Bess was a mystery as punt returner, not running back any of six kicks and fair-catching just one. Jones' philosophy is to make sure you get the ball back and not worry too much about field position, but Bess was clearly playing too far back and could've saved a lot of field position with some returns and more fair catches. Davone Bess joined Jason Rivers and Ryan Grice-Mullins in going more than 100 yards in receiving last week. The diversity of the Hawaii passing game and Colt Brennan's willingness to throw to whoever is open are two reasons it's so hard to stop. "I don't think you stop them," UNLV coach Mike Sanford said. "The thing you try to do is slow them down and hope to get them to make mistakes. Our offense needs to keep the ball and get first downs and scores." The Rebels have allowed just 137.5 yards per game via the air, but Utah State and Wisconsin are not passing teams. UNLV has five sacks and no interceptions so far. "Their defense is very disciplined, very good," Brennan said after watching the Wisconsin tape. "They execute perfectly and they have a great middle linebacker (Beau Bell). They have good talent." But there's no real reason to believe the Rebels can shut down the Warriors, who have scored in 34 of the last 36 quarters. UNLV held UH scoreless in the fourth quarter last year at Aloha Stadium, but that was after UH had gone up 42-7. X 84 Jason Rivers 6-2 189 Sr.
H 7 Davone Bess 5-10 195 Jr.
LT 62 Keith AhSoon 6-1 315 Jr.
LG 65 Hercules Satele 6-2 293 Sr.
C 55 John Estes 6-2 292 So. RG 73 Larry Sauafea 6-2 294 Sr.
RT 78 Keoni Steinhoff 6-3 282 Jr.
Y 1 Ryan Grice-Mullins 5-11 180 Jr.
Z 2 C.J. Hawthorne 5-11 168 Sr.
QB 15 Colt Brennan 6-3 201 Sr.
RB 48 David Farmer 6-1 224 Jr.
or 21 Kealoha Pilares 5-11 190 Fr. or 4 Leon Wright-Jackson 6-1 211 So. LE 54 Amani Purcell 6-4 277 Sr.
LT 96 Fale Laeli 6-1 292 Jr.
RT 67 Michael Lafaele 6-1 302 Sr.
RE 12 Karl Noa 6-4 251 Sr.
BUC 44 Adam Leonard 6-0 236 Jr.
MAC 17 Solomon Elimimian 5-11 218 Jr.
STUB 43 Brad Kalilimoku 5-10 221 Sr.
CB 3 Myron Newberry 5-9 174 Sr.
FS 35 Keao Monteilh 5-11 193 Jr.
SAM 31 Jake Patek 6-0 204 Sr.
CB 23 Gerard Lewis 5-9 175 Sr.
P 45 Tim Grasso 5-11 221 Jr.
PK 86 Dan Kelly 6-3 212 Jr.
SNP 57 Jake Ingram 6-4 234 Jr.
HLD 45 Tim Grasso 5-11 221 Jr.
KR 27 Ryan Mouton 5-10 182 Jr.
84 Jason Rivers 6-2 189 Sr.
PR 7 Davone Bess 5-10 195 Sr.